#861 found @ 22:00 with Kitty Cachers. After my pathetic DNF on this a few days ago, Kitty and I decided we would team up to try it again this evening. After a nice meal at the pub, we set off for this one in good spirits. Having got to the "starting point" with little trouble, it took a few minutes to see what we were looking for to start the trail. The route was a lot longer than we thought, and there were a few hairy moments when one or other of us was so busy looking for the trail that we almost tripped over tree roots or slipped down slopes. But we eventually made it to the cache in one piece. Great feeling of accomplishment - but if finding the cache was hard enough, finding our way back to the car was even harder - the trail we were following was anything but obvious on our return trip. But luckily my GPS held out and I was able to navigate us back with the breadcrumb trail it had logged. Don't know what we would have done if the GPS or head torch batteries had died at this point! 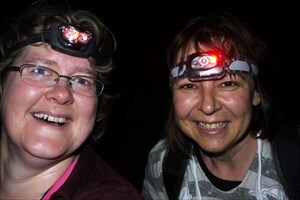 Attached is a pic of the pair of us looking relieved and slightly smug having found the cache.